Created and tested this new idea today. This is for custom_wf, though there aren't any variables beyond pAmount, so it should be easy enough to add to JWF if you like. The basic idea is to work with all of the pixels within a box whose width and height are both pAmount*2. 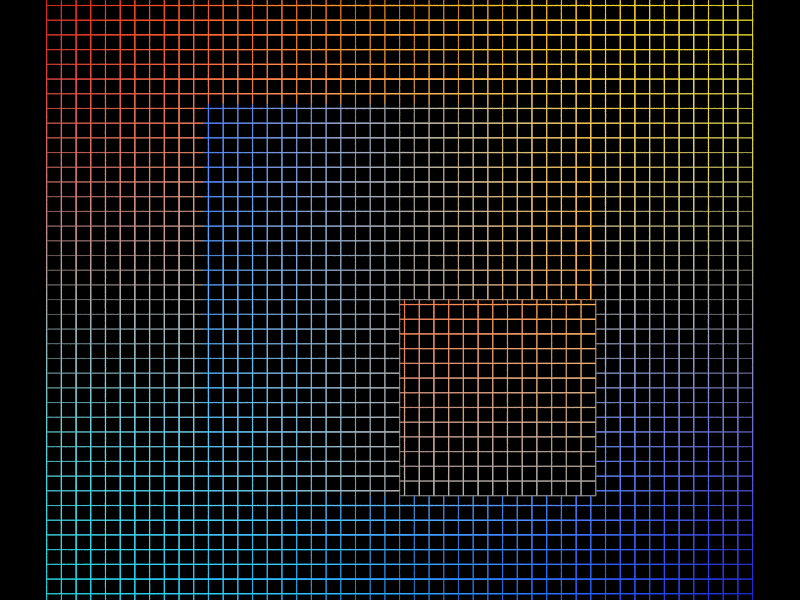 The pixels in a square region in the upper left corner of the screen are moved to the lower right corner of the screen. Everything else in the working region is flipped over the y=x axis. // Shift a box, whose width and height are pAmount, from the upper left of the graph to the lower right. // Then flip everything else over the y=x axis. Thanks for this new variation! Decided to add some variables to this one and also added another "type" that does some fun things. Also changed the name to tqmirror. 02110-1301 USA, or see the FSF site: http://www.fsf.org. // graph to the lower right. I hadn't toyed with JWF in a long time. Brad, I love it! All kinds of neat patterns you can make with it using only the first three variables! Glad you're still having fun with this stuff!